There are several OBDII protocols, so you may be wondering which set of protocol dependent XGauges are correct for your vehicle. You can view what protocol your vehicle uses via the ScanGauge by following the instructions to the right. We’ve also put together an outline of what protocol your vehicle may use based on it’s model year. Select your vehicles model year below to see a list of what protocol your vehicle may use. 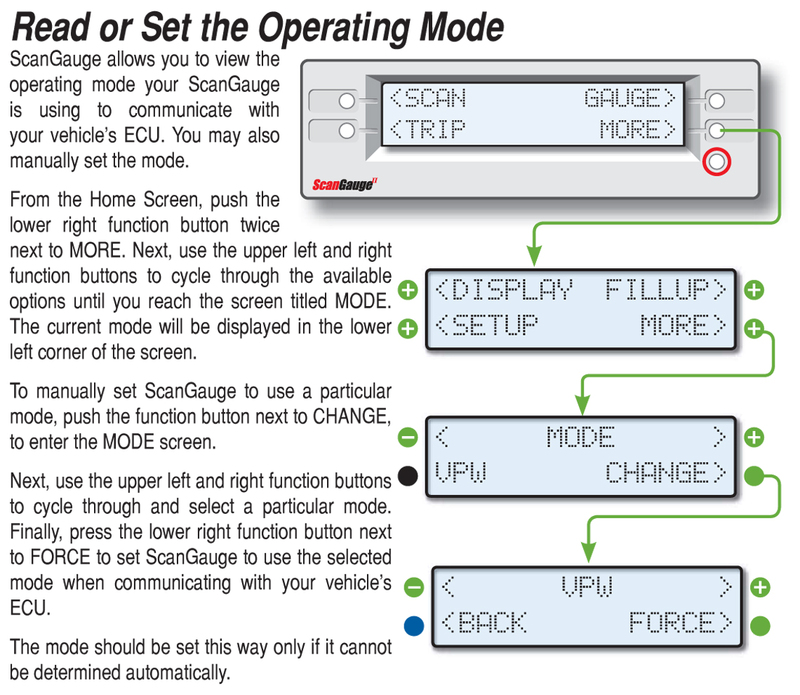 To be sure, you can always check the operating mode via your ScanGauge by using the instructions to the right. Between 2003 and 2007 manufacturers began rolling out the CAN protocol to their vehicles. Thus vehicles between 2003 – 2007 may use CANSF/CANLF or the protocol they typically used from 1996 – 2002. In 2008 all vehicles we’re required to use the CAN protocol. There are two version of CAN – Short ID CAN (CANSF) and Long ID CAN (CANLF). The CANSF protocol started being used in 2003 by a small number of vehicles. From 2003 to 2008 the CANSF protocol became more prevalent. Finally in 2008, all vehicles originally sold in the US or Canada were required to use the CANSF protocol. You can find out what protocol your vehicle is running with the ScanGauge by pressing MORE > MORE > MODE. Some sensors may not be reported by the vehicle. If you try all available XGauges for a certain sensor and it doesn’t report any data then the sensor is most likely not supported by the vehicle. The CANLF protocol is used predominantly by Honda/Acura vehicles. Honda/Acura began using CANLF in select vehicles in 2006. By 2008 all Honda/Acura vehicles used the CANLF protocol. Fiat vehicles also typically use the CANLF protocol, and some Dodge/Chrysler/Jeep also began using the CANLF protocol starting in 2012. You can find out what protocol your vehicle is running with the ScanGauge by pressing MORE > MORE > MODE. Some sensors may not be reported by the vehicle. If you try all available XGauges for a certain sensor and it doesn’t report any data then the sensor is most likely not supported by the vehicle. Most Asian, European, and Chrysler manufactured vehicles used the ISO protocol from 1996 to 2002. From 2003 to 2007 their vehicles will either support ISO or CAN. GM Vehicles almost exclusively used the VPW protocol from 1996 to 2002. From 2003 to 2007 GM vehicles will either support VPW or CAN. You can find out what protocol your vehicle is running with the ScanGauge by pressing MORE > MORE > MODE. Some sensors may not be reported by the vehicle. If you try all available XGauges for a certain sensor and it doesn’t report any data then the sensor is most likely not supported by the vehicle. Ford vehicles from 1996 to 2002 almost exclusively used the PWM protocol. From 2003 to 2007 Ford vehicles will either support PWM or CAN. You can find out what protocol your vehicle is running with the ScanGauge by pressing MORE > MORE > MODE. Some sensors may not be reported by the vehicle. If you try all available XGauges for a certain sensor and it doesn’t report any data then the sensor is most likely not supported by the vehicle. Some Asian & European market vehicles used the KWP protocol. You can find out what protocol your vehicle is running with the ScanGauge by pressing MORE > MORE > MODE. Some sensors may not be reported by the vehicle. If you try all available XGauges for a certain sensor and it doesn’t report any data then the sensor is most likely not supported by the vehicle.